Gastrointestinal symptoms from eating mushrooms may be a sign of a mushroom allergy. 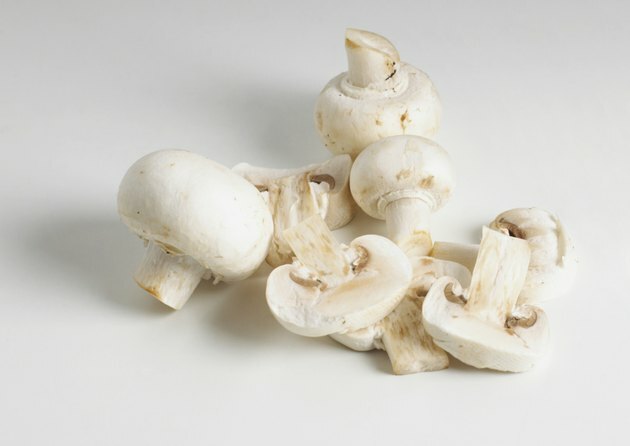 Although mushrooms are not considered a common food allergy, the Cleveland Clinic states that if you're allergic to mold you may experience a food allergy when eating mushrooms. If mushrooms trigger an allergic reaction, the lining of the intestines can become inflamed and swell from increased levels of histamine. A mushroom allergy is a serious medical condition that needs to be evaluated by your doctor. A mushroom allergy occurs when the immune system doesn't recognize the proteins found in the food. Because the immune system doesn't identify the proteins as safe, it attacks them with immunoglobulin E antibodies, which trigger mast cells to create histamine, according to the American Academy of Allergy, Asthma and Immunology. Histamine is a hormone in the body that helps to protect against infections and diseases. When histamine is created in excess, it causes blood vessels to dilate, increasing blood flow, increases mucus production and can cause the lungs to constrict. There is no cure for a mushroom allergy. A mushroom allergy is managed through diet by avoiding the consumption of mushrooms. When histamine is released in the lining of the intestines, inflammation occurs, which causes common digestive symptoms of a mushroom allergy. Common digestive symptoms include nausea, vomiting, diarrhea, cramping, abdominal pain and bloating. Your digestive system is the first one in the body to come into contact with the food you eat, which may cause these symptoms to develop within minutes. Other common allergy symptoms include sinus congestion, skin rashes, hives, headaches, light-headedness, shortness of breath and wheezing. To determine which type of mushrooms trigger an allergic reaction, your doctor may require that you see an allergist for testing. Allergy tests use your skin and blood to determine whether or not your body releases immunoglobulin E antibodies. During a skin test, a small amount of protein from a mushroom is injected under the top layer of the skin. If within 15 minutes the skin becomes inflamed, itchy or develops red bumps, you may have an allergy. The suspected allergy will be confirmed through a blood sample that is sent to a lab and tested for the presence of IgE antibodies. If you test positive for a mushroom allergy, your doctor may recommend that you stop eating all foods that contain mold. Common foods that need to be avoided include cheese, sour cream, sour milk, beer, wine, sauerkraut, dried fruits and pickled meat and fish.